This is the directory where to clean up. Use the '...' button to the right to browse for a directory. 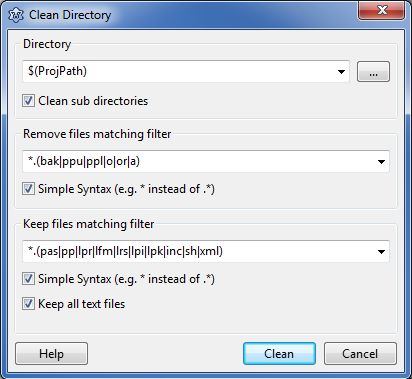 Enable 'Clean sub directories' to clean up recursively all sub folders. All files matching this filter and not matching the filter below are removed. For the syntax see IDE regular expressions. All files matching this filter will be kept, even if the above filter includes the files. Enable 'Keep all text file' to also keep all files, that look like text. That means, they do not contain special characters in the first 1000 bytes. This page was last modified on 22 March 2017, at 13:46.